Courteous, prompt, friendly and very helpful. Beautiful sunsets over the lagoon. Great accomodations, everything we needed was there. Comfortable King bed. The half bath was a great advantage for a one bedroom unit. The waterfront view is awesome and the pier at night was great. The gulf beach is a short walk and the pool was nice. We'll be back and can bring friends since there is a pull out couch. Very nice comfortable place to stay and not far from town, yet out of the congestion. Awesome stay at Sea Shore! House was big enough and adequate for our group of 10 (8 adults/2 children). Plenty of space. However, the sofa sleeper would not be comfortable for teens/adults (okay for young children). The saltwater pool was such an added bonus! The big dogs next door - no problem. Very nice dogs and owners. Internet was working great. It could be walking distance to the beach, however, if you have to take a tent, ice chest, etc., for an extended stay on the beach -- you need to drive. There is plenty of public parking not far, so that was never an issue for us. Great convenient location! Perfect weekend getaway in great location This property was great for a quick weekend getaway. 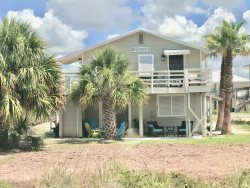 We traveled into town for the NCAA Beach Volleyball tournament and this duplex was in a perfect location. It is about a mile away from the Hangout (one of the main attractions on Gulf Shores) and the beaches could not be more beautiful. We stayed in the lower-level unit of this property and the guests that were staying above us were a little loud during the evenings, but it was nothing that we could not tolerate. We had a few issues with figuring out the locks on the doors, but the owner had recently replaced them, so he was learning how to use them. Overall, this is a nice property. Thanks!